The Global Volcanism Program has no activity reports for Taranaki [Egmont]. The Global Volcanism Program has no Weekly Reports available for Taranaki [Egmont]. The Global Volcanism Program has no Bulletin Reports available for Taranaki [Egmont]. The nearly symmetrical, steep-sided cone of Taranaki (also known as Egmont), is New Zealand's largest andesitic stratovolcano. 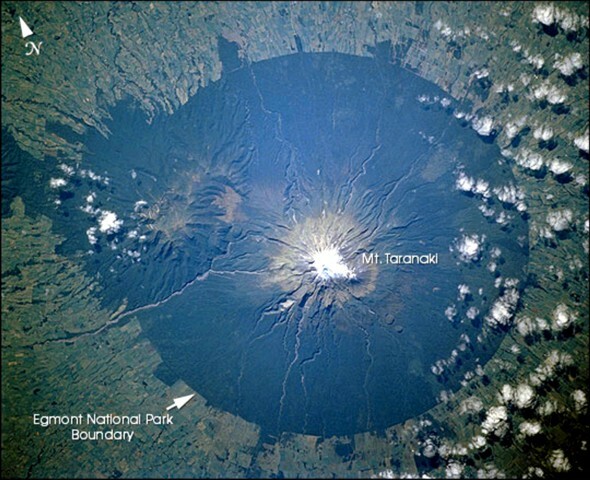 Taranaki is surrounded by a ring plain of debris-avalanche and lahar deposits that and extend to the coast. The isolated volcanic center is located on the west coast of central North Island at the southern end of a volcanic arc extending NW along the Northland Peninsula. Taranaki is the youngest and SE-most of a group of three volcanoes beginning with the Pleistocene Kaitoke Range. Fanthams Peak breaks the symmetry of Taranaki on its south flank, and four lava domes are located on the lower north and south flanks. Multiple episodes of edifice collapse have occurred in the past 50,000 years. Explosive activity, sometimes accompanied by pyroclastic flows and lava dome growth, has occurred frequently throughout the Holocene. Taranaki's latest eruption took place in 1854 CE. Alloway B, Neall V E, Vucetich C G, 1995. Late Quaternary (post 28,000 year B.P.) tephrostratigraphy of northeast and central Taranaki, New Zealand. J Roy Soc New Zeal, 25: 385-458. Carroll L D, Gamble J A, Houghton B F, Thordarson T, Higham T F G, 1997. A radiocarbon age determination for Mount Edgecumbe (Putauaki) volcano, Bay of Plenty, New Zealand. New Zeal J Geol Geophys, 40: 559-562. Downey W S, Kellett R J, Smith I E M, Price R C, Stewart R B, 1994. New paleomagnetic evidence for the recent eruptive activity of Mt. Taranaki, New Zealand. J. Volcanol. Geotherm. Res., 60: 15-27. Locke C A, Cassidy J, 1997. Egmont volcano, New Zealand: three-dimensional structure and its implications for evolution. J. Volcanol. Geotherm. Res., 76: 149-161. Neall V E, 1971. Volcanic domes and lineations in Egmont National Park. New Zeal J Geol Geophys, 14: 71-81. Neall V E, 1979. New Plymouth, Egmont North, Egmont South and Manaia. New Zeal Dept Sci Ind Res, 1:50,000 geol map, 3 sheets and notes. Neall V E, Alloway B V, 1986. Quaternary volcaniclastics and volcanic hazards of Taranaki (Tour Guide C3). New Zeal Geol Surv Rec, 12: 101. Neall V E, Alloway B V, 1991. Volcanic hazards at Egmont volcano. New Zeal Ministry Civil Defense, Volc Hazards Inf Ser, 1: 1-31. Neall V E, Stewart R B, Smith I E M, 1986. History and petrology of the Taranaki volcanoes. Roy Soc New Zeal Bull, 23: 257-263. Price R C, McCulloch M T, Smith I E M, Stewart R B, 1992. Pb-Nd-Sr isotopic compositions and trace element characteristics of young volcanic rocks from Egmont volcano and comparisons with basalts and andesites from the Taupo volcanic zone, New Zealand. Geochim Cosmochim Acta, 56: 941-953. Shane P, 2005. Towards a comprehensive distal andesitic tephrostratigraphic framework for New Zealand based on eruptions from Egmont volcano. J Quat Sci, 20: 45-57. Turner M B, Cronin S J, Bebbington M S, Platz T, 2008. Developing probabilistic eruption forecasts for dormant volcanoes: a case study from Mt Taranaki, New Zealand. Bull Volcanol, 70: 507-515. Ui T, Kawachi S, Neall V E, 1986. Fragmentation of debris avalanche material during flowage; evidence from the Pungarehu Formation, Mount Egmont, New Zealand. J. Volcanol. Geotherm. Res., 27: 255-264. There is no Deformation History data available for Taranaki [Egmont]. There is no Emissions History data available for Taranaki [Egmont]. Symmetrical Taranaki (Egmont) volcano dominates the western coast of New Zealand's North Island. The 2518-m stratovolcano, seen here from the south, is surrounded by a ring plain of debris avalanche and lahar deposits produced by repetitive collapse of the volcanic edifice. 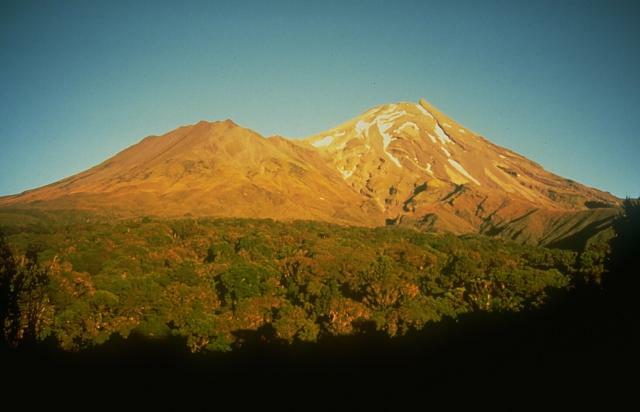 Taranaki (Egmont) has been active throughout the Holocene. The latest eruption of Taranaki took place in 1854 CE. Tarankai (Egmont) volcano has a breached summit crater that is occupied by a partially destroyed lava plug. This view from the SE shows the stacked lava flows that form much of the cone, with the vegetated slopes of the parasitic volcano, Fanthams Peak, at the left. 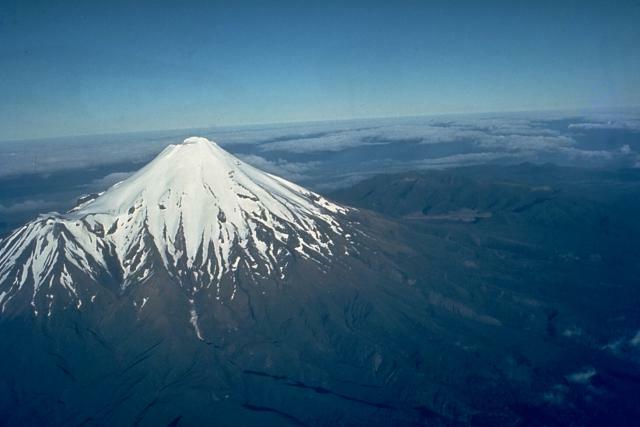 Both Taranaki, the Maori name, and Egmont, the name assigned by Captain Cook, are used for the volcano. Photo by Chris Newhall, 1986(U.S. Geological Survey). Grass-covered conical hills dot the plains around Mount Taranaki (Egmont), on New Zealand's North Island. 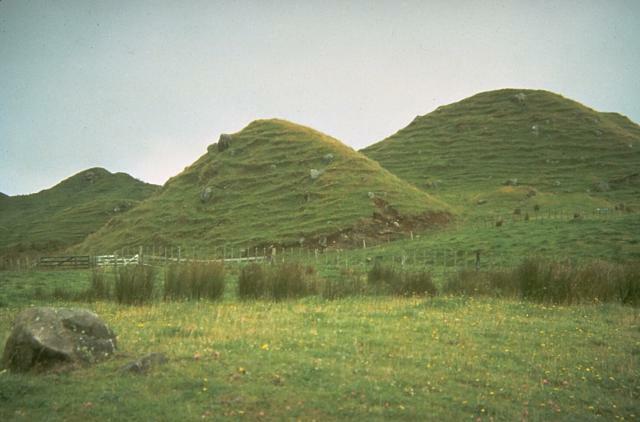 Small hills such as these, often located in lowland areas well beyond the flanks of a volcano, were once thought to be cinder cones or small secondary vents produced by explosions when a lava flow passed over a body of water. They now are known to be hummocks of massive debris avalanches produced by volcanic landslides. Debris-avalanche deposits originating from repetitive collapse surround the volcano to distances of about 40 km. Photo by Don Swanson, 1984 (U.S. Geological Survey). 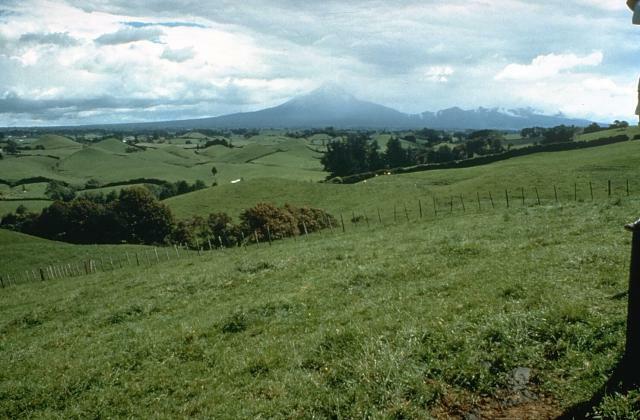 The pasture-covered, hilly terrain in the foreground is part of a vast ring plain of debris-avalanche and lahar deposits that surrounds Mount Taranaki (Egmont). Repetitive collapse of the volcano during the late Pleistocene and Holocene produced debris avalanches that reached the western coast, nearly 40 km from the volcano. An aerial view from the south shows Mount Taranaki (Egmont), with its parasitic volcano of Fanthams Peak at the lower right. 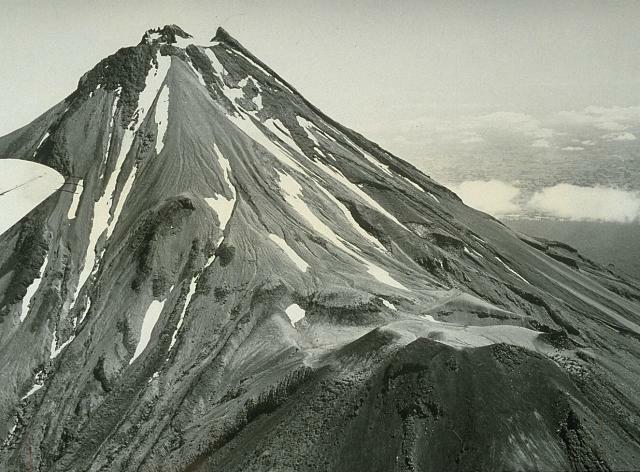 The summit of Taranaki contains a partially destroyed lava dome; four other lava domes are located low on the south and north flanks. 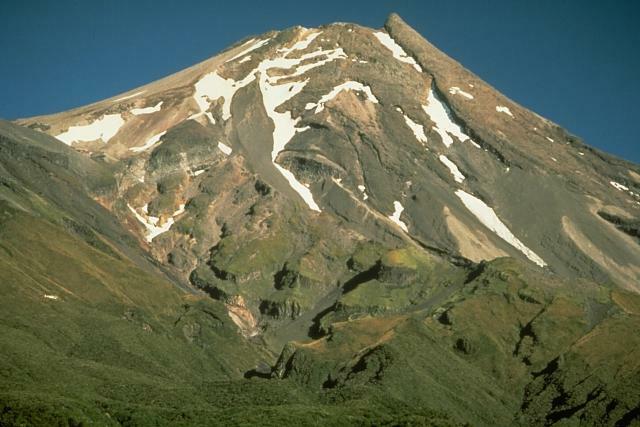 Taranaki volcano collapsed and rebuilt itself repetitively during the late Pleistocene and Holocene. Photo by Jim Cole, 1971 (University of Canterbury). Taranaki volcano, seen here from the SW, rises to 2518 m above the Taranaki ring plain, with its parasitic volcano Fanthams Peak on the left. Taranaki (Egmont) is the youngest and SE-most of a group of volcanoes beginning with the Kaitoke Range, near the west coast of North Island. Tarananki has been active during the past 125,000 years. Its most recent activity, during the 15th to 19th centuries, included the eruption of airfall tephra, pyroclastic flows that traveled to the NW, and emplacement of the summit lava dome. Photo by Chris Newhall, 1986 (U.S. Geological Survey). Mount Taranaki volcano is the centerpiece of Egmont National Park on the western side of the North Island of New Zealand. Farmlands surrounding the volcano extend to the boundaries of the national park, leaving a circular pattern prominent from space. The Pleistocene Kaitoke Range forms the topographic high WNW of Taranaki. Photo courtesy of NASA (www.earthobservatory.nasa.gov). There are no samples for Taranaki [Egmont] in the Smithsonian's NMNH Department of Mineral Sciences Rock and Ore collection. IRIS seismic stations/networks Incorporated Research Institutions for Seismology (IRIS) Data Services map showing the location of seismic stations from all available networks (permanent or temporary) within a radius of 0.18° (about 20 km at mid-latitudes) from the given location of Taranaki [Egmont]. Users can customize a variety of filters and options in the left panel. Note that if there are no stations are known the map will default to show the entire world with a "No data matched request" error notice. Large Eruptions of Taranaki [Egmont] Information about large Quaternary eruptions (VEI >= 4) is cataloged in the Large Magnitude Explosive Volcanic Eruptions (LaMEVE) database of the Volcano Global Risk Identification and Analysis Project (VOGRIPA).